Buenos Aires, El Calafate, El Chalten, Ushuaia, Lago Esmeralda, and more! A Gay Travel Argentina Cultural Tour. Argentina is a land of contrasts. 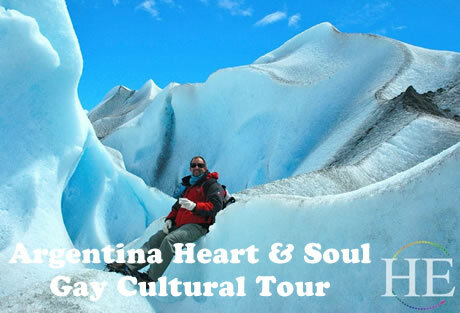 Join us to witness its amazing beauty from Buenos Aires to the glaciers and mountains of the mystical land called Patagonia. For a complete contrast, we conclude with an optional extension to the tropical mists of Iguazu Falls. 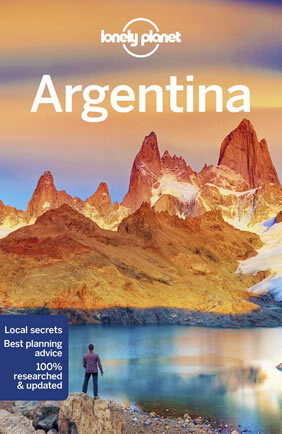 Join us to explore the contrasts that make Argentina such a rich place to visit from its greatest city to the heart of Patagonia. 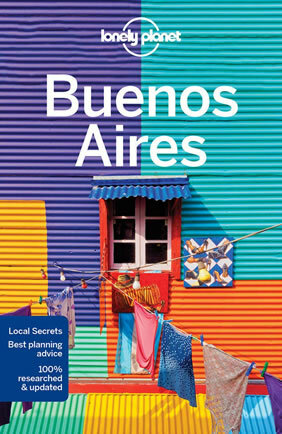 We start and end in Buenos Aires – proudly considered by its residents as the most European city in South America. Then we head to the southern Andes where we stay in a small lodge overlooking Lake Viedma. We’ll then have a chance to walk on the glacier, as well as to explore nearby forest trails. Then we continue south to Ushuaia – at the southern tip of South America, and explore the unique landscape around the Beagle Channel. We conclude our tour back in Buenos Aires, with our farewell dinner at a lively tango show. 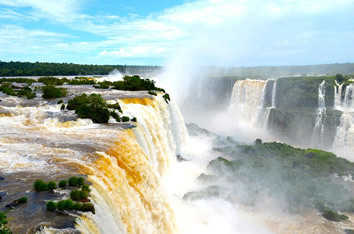 For those with enough time, we also feature a three-days post-tour to Iguazu Falls. • Enjoy magical nights in Buenos Aires. • Sail on a glacial lake. • Hike on the Viedma Glacier. • Scout the surrounding alpine forests. • Savor dinner and wine tasting in a rustic lodge at El Chalten. 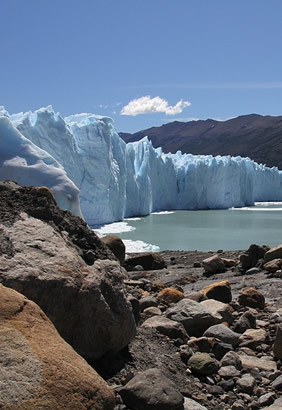 • Visit the Perito Moreno section of Los Glaciares National Park to see one of the last advancing glaciers in the world. 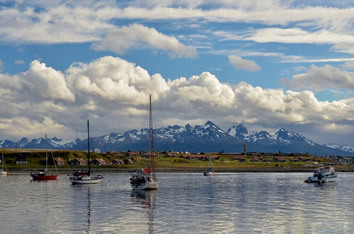 • Explore the mountains and channels at the tip of South America from Ushuaia. Join us for an optional 2-night post-tour to visit the spectacular falls of Iguazu, including a guided hike at the top of the falls, and a boat ride below the cascade. Most travelers will depart from home the day before our trip starts, and take an overnight flight to Buenos Aires. Upon arrival in Buenos Aires a transfer will be provided to our modern hotel near the famous Recoleta Cemetery. 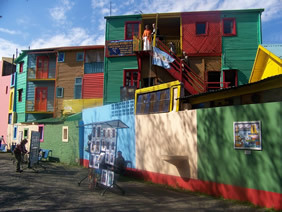 Buenos Aires is the capital city of Argentina and one of the largest in the world, with a total population (including the suburbs) of 14 million. Around a third of the total population of Argentina lives in the area. Buenos Aires was founded twice because the first settlement was destroyed by Indians. We will meet in the early evening for a reception and welcome dinner at our hotel. Please note that because Argentines typically have their main meal as a late lunch, then have a lighter meal very late in the evening. In that custom, some of our included meals will be at lunchtime, showcasing the wide variety of culinary traditions in Argentina. On those days your evening meal will be on your own so that you can decide to wait and dine with the locals (at 10 pm or even midnight), or eat earlier if you wish. Any of our meals may be later than you are accustomed to, so if you need to eat at regular intervals, you may want to carry a snack. We start our gay travel Argentina experience at its heart, with a full-day tour of the city of Buenos Aires. Highlights will include the Plaza de Mayo, the most famous square of the city, from which we can get photos of the surrounding buildings. One is the Cabildo, a municipal building during the colonial period and now a museum. However, the most famous building on Plaza de Mayo is La Casa Rosada or The Pink House. It is currently the official seat of the executive branch of Argentina’s government, but the balcony of La Casa Rosada is where Eva and Juan Peron (and Madonna as Eva!) stood to address crowds during their political rallies. In the square you may also see Madres de Plaza de Mayo, relatives of people who disappeared during the last military government, asking the government to continue the search for their missing relatives. We finish our introduction to Buenos Aires by driving through the colorful traditional neighborhoods such as San Telmo, as well as the fancy Palermo, Barrio Parque and Recoleta Districts. Before returning to our hotel we will stop to see the many remarkable tombs at Recoleta Cemetery, including that of Evita. During our tour, we will have lunch together at one of B.A.’s finest restaurants. Early this morning we will transfer to the nearby domestic airport then fly to El Calafate, high on the Patagonian Andes plateau. Upon our morning arrival, we drive west to the southern slopes of Los Glaciares National Park, to visit Perito Moreno Glacier, on an arm of Lago Argentino. This glacier, one of the few advancing ones in the world, separates a branch of the lake from its natural drainage, producing a natural dam. When the water pressure gets too high, it erodes the wall of the glacier, breaking it, and huge chunks of ice fall into the water. We will have a late lunch in El Calafate, then free time in the afternoon to explore on our own. 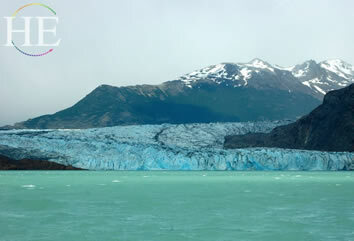 This morning we drive to El Chalten, located in the North of Los Glaciares National Park. 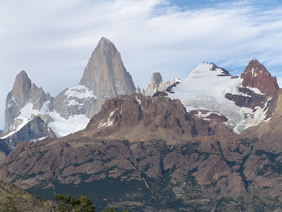 This very young, small, remote town has become the trekking capital of the country and is located very close to Fitz Roy and Torre Mountains, among the toughest granite climbs in the world. This afternoon is devoted to exploring the area. 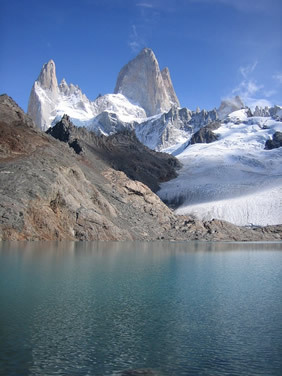 We will walk into the forest for spectacular views of Fitz Roy and Torre Mountains. We will also visit Lago del Desierto and Rio Las Vueltas, and have a picnic lunch along the way. For our two nights in El Chalten, we will stay in a modern 21-room lodge built in the architectural style of 1920 when the area was first settled, and offering great views of Fitz Roy. We will have a wine tasting and dinner at the lodge this evening. After breakfast this morning we head to the nearby Bahia Tunnel, to get on a ship to sail on the western part of Lake Viedma. This pristine lake is fed by the Viedma glacier, a part of the continental ice field. We will then get off the ship and walk to the edge of the glacier. There we will be given crampons and our guides will take us to walk on the glacier, for some spectacular views of the lakes and mountains. Return to the ship, and then back to Bahia Redonda, arriving mid-afternoon, and enjoying a box lunch along the way. The rest of the afternoon will be free to relax or enjoy short walks or other activities. Day 6 - Off to Ushuaia! We will depart El Chalten early this morning, then drive directly to El Calafate Airport for our flight to Ushuaia. This is the southernmost city in the world, located on the island of Tierra del Fuego (land of fire). It was named this because the natives who once called this area home lit up fires on the coast and the explorers such as Magellan could see the fires from a distance. We’ll arrive at Ushuaia in the early evening, check into our classic hotel up a small hill from the main commercial street, then have dinner together at a local restaurant. Today you can select from one of two options to explore the landscape at the tip of the continent. Please note that depending on how many people choose each option, you may participate in today’s activities with other visitors to Ushuaia besides our group members. Lago Esmeralda Trek: a 7-hour excursion in Tierra del Fuego National Park, including transfers from town and easy trekking, with a box lunch provided. Walk through forests and marshlands, and see small multi-hued lakes created by beaver dams. Walk to Laguna Perdida, where we will stop for a box lunch. After the hike, transfer back to our hotel. Harberton Ranch Excursion: this leisurely tour starts with a boat ride on the Beagle Channel, with the possibility of seeing sea lions and a wide variety of birds. Weather conditions permitting, we will also make a 15-minute stop at a penguin island rookery. The excursion includes an introduction to the coastal marshes and wooded hillsides of historic 19th-century Harberton Ranch, and a van ride through the foothills back to Ushuaia. This morning we will visit the main part of Tierra del Fuego National Park, located 11 km away from the city. This is the only National Park in Argentina which combines mountains, forests, glaciers, and the ocean. 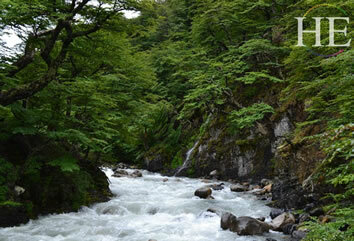 We will walk along Roca Lake and Lapataia River, close to the Chilean border, passing Green and Black Lakes. We end the walk in Lapataia Bay after passing some beaver dams (brought into the area from the USA and now a pest which is threatening the native forest). After our hike we will board a catamaran to navigate the Beagle Channel back to Ushuaia’s harbor, passing by several islands and bays, where we will be able to see large colonies of seabirds and some marine mammals. The afternoon will be free to explore Ushuaia on own or try other activities such as riding the Martial Glacier chairlift if it is operating. In the morning, we will transfer to the airport to fly back to Buenos Aires, then transfer to our hotel. For the rest of the afternoon, you can wander or shop in our Buenos Aires neighborhood, or rest up to be ready for the festive finale to our tour. In the evening, we will go to the area of Barracas for a late Farewell Dinner and one of the best tango shows in the land that made the dance famous. We will return to the hotel after midnight. Today is on your own until your flight home or to Iguazu Falls. For those with evening flights, please note that hotel check-out is at 11 am, but a late check-out may able to be arranged. If there is enough interest, we will also offer an excursion to the northern suburbs with navigation in the Tigre Delta of Rio de la Plata and lunch. We will provide a transfer to the international airport in time to check in for flights home. 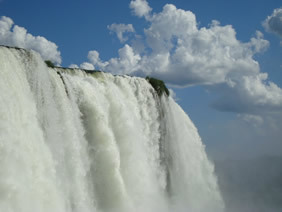 Stay longer to visit Iguazu Falls! Fly into to Puerto Iguazu, Argentina, on the border with Paraguay and Brazil. This small town is at the confluence of the Iguazu and Parana Rivers, natural borders between the three countries. Transfer to the Sheraton International Hotel, which has a wonderful view of Iguazu Falls, and is located a few steps away from the middle of a sub-tropical rain forest. The hotel is the only one inside the National Park, in a natural environment where pumas, jaguars, alligators and many colorful birds live. We’ll have time this afternoon to walk on the walkways overlooking the falls and use the swimming pool before dusk. Enjoy this time at your leisure and enjoy dinner on your own this evening. In the morning, visit the Argentina side of the falls, including Garganta del Diablo (Devil’s Throat), the highest fall of the whole complex. We will offer a boat ride through the rapids at the bottom of the falls for a very close look at the powerful river. We will then travel further downriver, returning to the hotel through the jungle in a four-wheel-drive vehicle. Some of the wildlife that we might see in the area includes tapirs, toucans, vultures, capybara, monkeys, and even jaguars. We will have time to relax this morning at our hotel, then pack and freshen up prior to transferring to the Iguazu Falls Airport to fly to Buenos Aires. • Services of HE Travel tour director (subject to minimum participation). This tour starts and ends in Buenos Aires, Argentina. To fully enjoy this tour, one should be able to walk for extended periods on uneven surfaces and enjoy outdoor activities. The tour includes a glacier walk and an optional trek to a mountain lake.